These clear Asian spoons are the best proof that elegant presentation was never easier! The glass like look gives these Asian spoons the character they need to present your culinary delights with even more style. Each package contains 24 of these stunning clear Asian spoons. They can be used for Japanese cuisine, sushi, sashimi, tartare, crushed fruits, deviled eggs, or anything that requires elegant presentation. Each one of these plastic Asian spoons can be disposed of or washed and re-used as many times as you would like! Perfect for tastings, trade shows, food shows, sampling and showing off your culinary prowess. The free standing nature of these spoons makes them deal for display purposes. See our full line of miniatures serveware ideal for both dessert and savory foods. 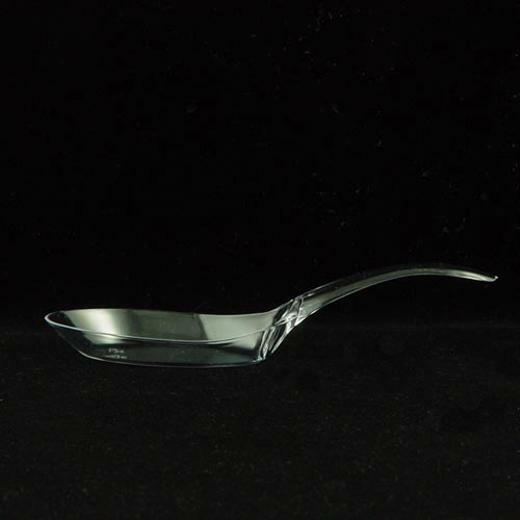 Dimensions: 4 1/2 inches long, Spoon portion is approx 2.5" and holds approx. 2 solid oz. L: 5.25 in. W: 1.75 in. H: 5.25 in.